One-man development team Caustic Reality has only been around for a couple years, but its debut effort, the horror game Infliction has been reaping praise from players and pundits alike since its release on October 18, 2019. In our review, Edward stated the following: ‘Infliction weaves realism and horror into a tragic tale and proves that your own home can be a terrifying place‘. As part of our Made In Australia segment, we caught up with Caustic Reality’s main man, creative director, coffee getter and well, everything else to get the lowdown on Australia’s scariest release this year. 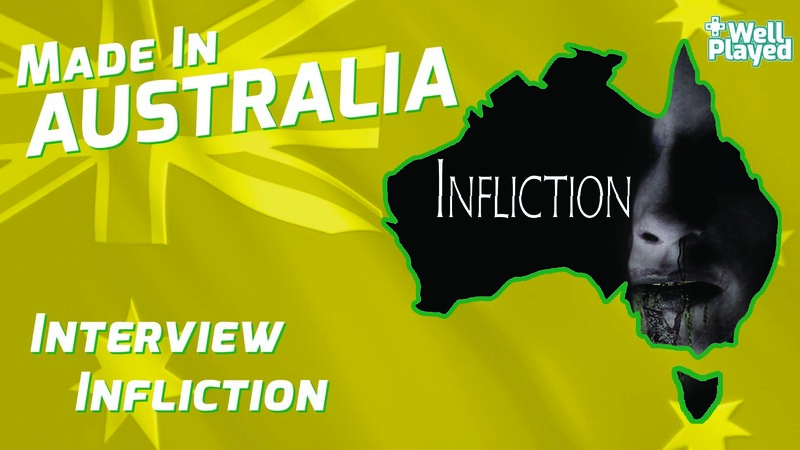 WellPlayed: Thanks for taking the time to chat with us for Made In Australia about Infliction. Give us a brief synopsis of what Infliction is all about. Clinton McCleary: Thanks for having me! Infliction is a story-driven horror game. You’ll wander through the remnants of a once-happy family, reading letters and journals, listening to voicemails, and piecing together clues to understand the terrible events that led you there. However, you are not alone. Something else has remained in this house, a being of infinite grief and rage. While you hunt for clues, it hunts you, waiting for its chance to unleash anger on you. WP: When did development of Infliction begin? CM: January 2016. I was on holidays from my job and started building a template. This was the birth of Infliction. WP: How did the premise come about? CM: Initially I was building a template that would allow me to tell a story similar to the way Gone Home worked. I worked for months before knowing what the premise would be. Then my daughter Charlotte was born, and I totally changed as a person. I started writing the story at this point, and the narrative of Infliction was the result. WP: What made you choose America as the setting? CM: I loved the setting of Alan Wake. That was a quiet mountain town where something seemed off. I suppose that town would have been inspired by something like Twin Peaks. The town where Infliction is set is never shown in the game, but it’s spoken about a lot. I wanted the town to have a similar feel from the perspective of the player’s imagination. A mysterious and heavily-wooded mountain town with history. I suppose I could have set that in another country, but it just felt right given my inspirations. WP: It’s fair to say that the game focuses on some dark themes. Are any of these related to personal experiences? CM: Yes. The story is totally fictional, and I don’t know anyone that has gone through anything to the degree or horror that Infliction explores. Some of the other themes like depression I have personal experience with. Also, many of the story beats come from my deepest fears at the time of writing the story. Being a new father at the time, I suppose that makes sense. WP: Why did you want to talk about themes such as mental health, alcoholism and abuse? CM: I wanted to touch on real themes. Some themes I have more experience with than others, but I really wanted to shine a light on the fact that these issues are real and for some, this isn’t fictional horror, it’s their life. We need to be better to one another. I also wanted to tell a story that would elicit an emotional response from the player, and stay with them long after they’ve stopped. WP: The game reeks of inspiration from games like P.T. and Gone Home. Did you harness any influence from the aforementioned titles or any other horror games? CM: Gone Home was a huge influence with its world-building, interactivity and storytelling. P.T. definitely inspired as a stellar example of how to build tension in a familiar setting. Alan Wake also served as inspiration for the greater world outside the boundaries of the play space. My love for horror extends to the genre as a whole. To be perfectly honest, I don’t play many horror games. The only other game that held much influence over me was Alien Isolation, and the way the AI would hunt you in that. Besides that, I draw my inspirations from plenty of movies and TV shows. WP: Infliction relies more on its atmosphere to build tension and trepidation, instead of an over-reliance on horror tropes such as jumps scares. Was this a focus during development? CM: Yes, horror works best in the moments between the horror. The tension and atmosphere was a huge focus and was mostly achieved with sound. I put an extremely heavy emphasis on sound, particularly in the latter part of development. WP: What do you think makes a good horror game? CM: A good story along with the environment, and the atmosphere that accompanies it. Sure, things chasing you is scary – but they represent a punchline. It’s the build-up where your imagination fills in the blanks. The world itself needs to feel like a living, breathing thing. Then you’ll get that sense of someone watching you all the time. If you add story to that world, it just makes it even more alive, as though if the walls could talk, they’d tell you things. WP: Sound is obviously an integral component of creating that unsettling atmosphere. Did you compose the soundscape or did you hire someone with experience in the field? CM: I composed the soundscape myself. I used a combination of licensed samples, and samples I recorded with my Zoom H5 and a shotgun mic. I tried to make the soundscape also suit the environment it’s married to, based around a common theme. For instance. In the mirror world, everything is backwards, and so the soundscape is also reversed. I can’t give any more examples without spoilers, but I used this method throughout the entire game with themes and sound. Most of the soundscapes are composed of many-layered samples to create something that tells its own story. I also have a couple of examples of dynamic soundscapes where I used loops to have the tension increase as you move toward an objective. Because I can’t control the player’s movements, a system had to be designed for this. I only used it sparingly in a few key areas, but it was really fun to make. WP: What was the most challenging aspect of Infliction’s development from a gameplay perspective? CM: Early on I had made the decision to make everything interactive. Books you can read, TV you can watch, kettles you can boil etc. This turned out to be extremely ambitious. The challenge here was that everything needed a lot of attention to detail. For example, typically for books on a bookshelf you’d make a bookshelf asset with book spines attached to the shelf itself. Detailing the spines only. Because you can pick up and read each book, that interaction had to be programmed in and the assets created, stories written etc. The ‘interact with everything’ gameplay element was by far the biggest challenge for me, but something the players have loved. WP: Hovering by your booth at PAX you seemed to get a lot of people comparing it to P.T., how do you respond to that comparison? Does that increase the pressure or validate your hard work? CM: It doesn’t bother me. It’s how people Identify with or explain things. It does add a little pressure in that it sets an expectation and that’s not typically a good thing. I hope Infliction lives up to what people think it is on its own terms. Infliction was inspired by real-world issues and other forms of media, so I always hope that players can appreciate it as an original piece of work. It’s also an honour as a solo indie first-time gamedev to be compared to something Kojima and Del Toro worked on. WP: You mentioned that Infliction also has a heavy influence from horror films? Which horror films in particular and what elements did you utilise exactly? CM: Movies like the Evil Dead series, the first couple of Hellraiser movies, The Ring, The Exorcist (movie and TV show) to name a few. I think anyone familiar with those movies will see their inspirations throughout Infliction for sure. I’m definitely more inspired by movies and TV than games, and I hope that brings a unique feel to Infliction and its story. WP: What inspired the game’s camera mechanic? A very cool mechanic may I add. CM: There is a remake of a very old movie made back in the early 2000s called House on Haunted Hill with Geoffrey Rush and Famke Janssen. In one scene in that movie, there is a girl in a basement looking through the viewfinder of a camcorder. She ends up in an operating theatre where she can see a mad doctor performing surgery on an unwilling patient. When she lowers the camera they’re gone, raises it again and they’re back. This inspired the original idea. I was going to recreate that scene in Infliction, but the idea grew. I didn’t want people walking around looking through a video camera the whole time, though. Outlast did that already! Mobile phones are out because of the time period, so I landed on a still camera. Then, Polaroid-style cameras are the only cameras that I know of that produce an instant physical photo and existed in the time frame the game is set in. It was a mechanic born out of problem-solving for one key moment I had in my mind! WP: Currently the game is only available on Steam. Are there any plans to port it to consoles? Or maybe VR? CM: Yes, I plan on porting the game to consoles sometime next year. I’d also love to do a VR version, but that is going to require a total rebuild and reworking of many assets and segments. I’m up to the challenge, but if I do make Infliction VR it’ll likely be a shorter, tighter experience. I really can’t wait to get it on to consoles though. It’s easily the thing I’m asked most about by fans! WP: How long can we expect the Infliction campaign to last? CM: That depends on the type of player you are. Most will finish the game in around four hours. I’ve seen play testers take up to six hours, and I’ve seen Youtubers finish it in three hours. So I’ll take the middle ground and say four hours on average. WP: The public’s initial response to the game has been positive, you must be pleased about that? CM: Yes, I’m shocked to be honest. I thought the reception would be much more of a mixed bag. I couldn’t be happier with the positive response and I greatly appreciate all the reviews and feedback! WP: What’s the best feedback you’ve received from a player? CM: The best feedback in terms of making me feel good, would be that I’ve had people message me and tell me this is one of the scariest games they’ve ever played, and they thank me for making it. I never really know what to say to that, but it puts a smile on my face! The best feedback in terms of helpfulness has been in the form of reviews and discussion boards on Steam, where I can identify pain points for people. One such instance was that each time you die, a short cinematic would play when you wake up. This is good once or twice, but if you die a lot the cutscene can get tiresome – the player feedback helped me realise this. I’ve just implemented a feature where this cutscene will only play once, and each time you die now you just respawn ready to go. It’s an improvement to the experience and I wouldn’t have implemented it without the constructive feedback. WP: Was there anything you wanted to include in Infliction but simply ran out of time/resources? CM: Yes, I have never publicly spoken about this content before, but I have another four episodes of a TV show I shot but never edited along with lots of content that is of a supplemental nature. I’m planning a big content update to be completed before console porting starts. It’ll contain things I had to cut due to time, like the TV show, TV commercials, additional ‘scares’, more easter eggs with the camera, and a big addition that will be announced upon the release of the update! WP: Do you have any plans to release any post-launch DLC? CM: No, I plan on doing a content update for free and improving player experiences with bug fixes and adding different language supports. I may do something with the VR version, but I haven’t locked anything down yet so it’s all just ideas and speculation at this point. WP: Thanks again for chatting to us, all the best for the future, we can’t wait to see what comes next. CM: Thank you! And thank you for the support of Infliction. Stay tuned for the in-depth feature on the origins of Caustic Reality, which should drop sometime in the next few days.